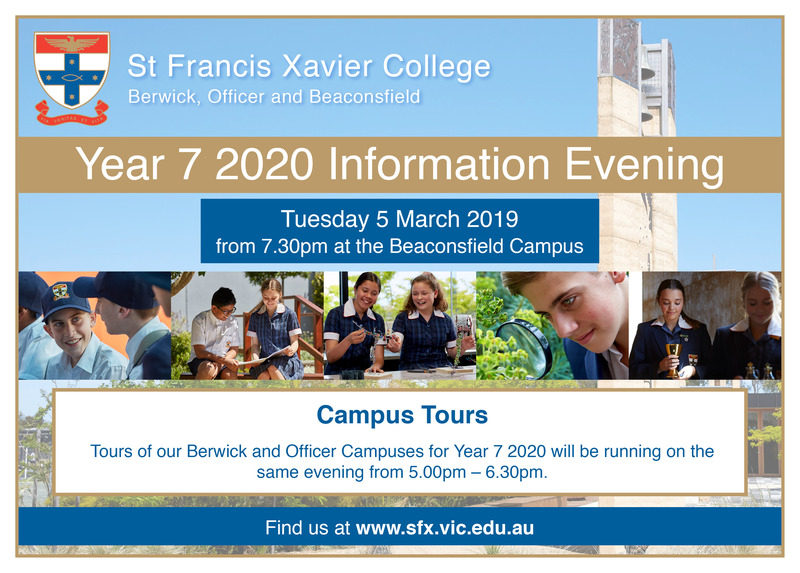 Our Parent/Student Information Evening will be held on Tuesday March 5 2019 in the St Francis Xavier College Hall at the Beaconsfield Campus, commencing at 7.30pm. This meeting will include information for both the Berwick and Officer Campuses. Tours of the College will be conducted at the Berwick and Officer Campuses only prior to the meeting at 5.00pm. The last tour will depart at each Campus at 6.30pm. This will allow you time to travel to the Beaconsfield Campus for the meeting commencing at 7.30pm. Please contact the Admissions Office on 9707 3111 should you have any queries.